When we decided to move away from Costa Rica one of the biggest things my then 12-year-old son was sad about leaving was his favorite surf spots. All of the places we have been to in Southeast Asia have been amazing in so many ways, but they are all lacking in ocean waves. So once we decided to visit Singapore my son found information on the Wave House on Sentosa Island and I knew this was one place that we had to be sure to see during our short stay. 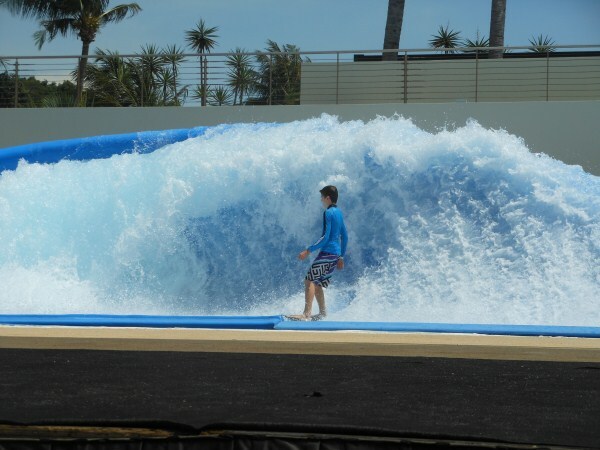 The Wave House is not just a beach, or just a pool, or even just a surf shop. 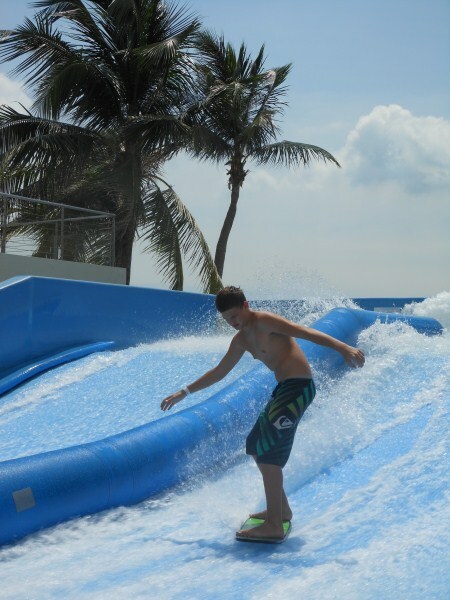 It is a flowboarding venue where you can experience a real California atmosphere under the hot sun of Singapore! There are 2 riders; a flat double flow rider and then the more advanced 10-foot flow barrel. The barrel is not for the faint of heart and I would certainly suggest a good amount of time on the rider first. But there were some guy going for it on the barrel just 1 hour after learning to surf on the rider. 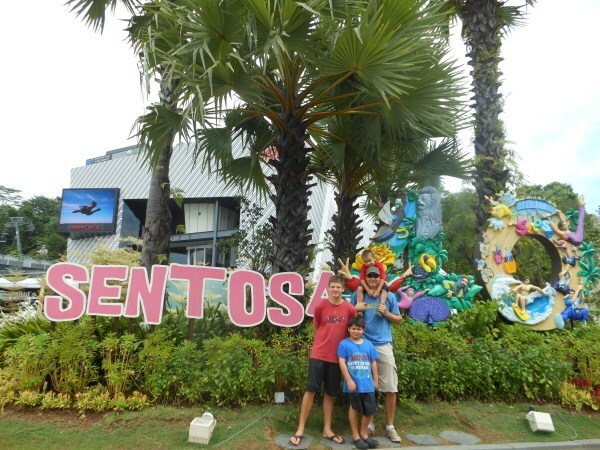 We arrived at Sentosa island after a quick taxi ride from the mainland and immediately our senses were on overload. The island is like a huge playground for adults, teens, and children alike. After walking around and trying out some of the other attractions we made our way from Beach Station over to the Wave House (Sentosa has a free tram but we walked). My boys excitement level rose as we approached the building with music pumping and surfer dudes holding the door open for us. Wave House graciously hosted us with 3 ride tickets, one was mine and the other two for my oldest sons. 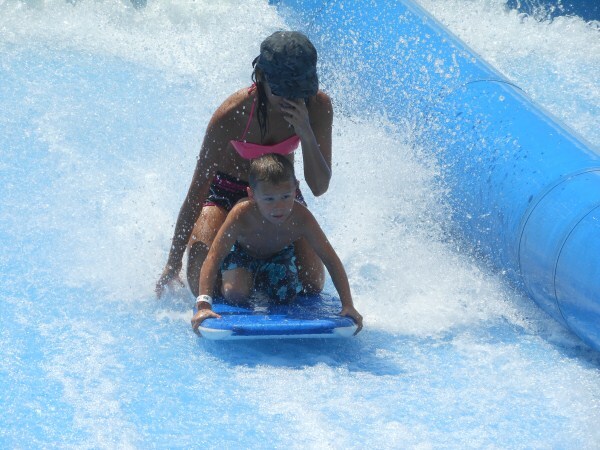 I never imagined in a million years that my 5-year-old would be able to ride the waves, so I had initially decided to have him stay back at the hotel with my husband. Luckily, they decided to tag along with us just to watch the fun unfold! As soon as my 5-year-old got a glimpse of the wave rider, he immediately threw his 10th fit of the day insisting that he be allowed to ride. My first thought was no way as a full-grown man tumbled forward by the force of the wave. However, I quickly thought "oh yes, now he can take my place and I can bow out for the good of my son rather then the fear I have of 1.wearing a bathing suit in front of all these people and 2. falling miserably in my attempt at surfing...again." This could work! The staff was very helpful in setting up the rides as well as switching mine to my son's so he could give it a try. We arrived in the middle of an hour-long session which gave us plenty of time to observe the amateur surfers have radical rides and even more radical wipeouts. We toured around the air conditioned and reasonably priced surf shop and enjoyed the beach, which is right in front of the Wave House. As we waited we also ordered food and drinks. The prices are high if you are used to some of the less expensive countries in SE Asia, but the tapas or snacks menu were actually quite affordable. When we got the food we were stunned at just what a good deal it really was...the portions were HUGE! The food was good, drinks were ice cold, and the chairs were super comfy. Aside from the wave pools themselves, the nicest part of the day was soaking in the sun, music, and giggles from the kids. Everyone there, from the staff to the patrons were jovial and having a great time. The bars also seemed great, but we left a bit early to really check them out. I got the distinct feeling that when the sun goes down Wave House becomes even more fun then it was during the day. On the flow rider you can either try standing or you can use a boogie board. 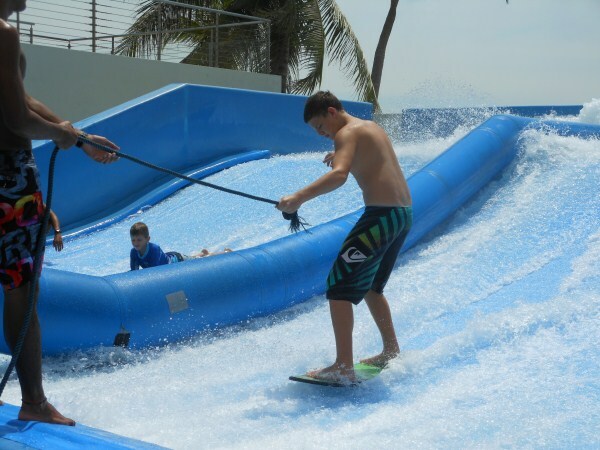 The flowrider is double sided to handle two riders at once. It creates an endless sheet of water that flows at 20mph over a vinyl padded sheet, so when you fall, and you will fall, it doesn't hurt. The staff working the rider were all really skilled, helpful, and kind to all levels. The boys patiently awaited their turn on the ride. My oldest was anxious as he watched and wondered if he could still do it. My 9-year-old was not very nervous until the moment the water started up for his turn, and my fearless 5-year-old was just giddy with excitement and was the first to go. Grinning ear to ear as the water splashed his cheeks, he maneuvered the boogie board. When his turn was just about over the women attendant jumped on behind him and helped him get to standing..he was thrilled and beaming with joy. He loved every minute of it. 9-year-old took a spill on the first run with the boogie board swallowing some water (probably because he was smiling so eagerly), getting flushed to the back end, and being hit by the board. He sat out the rest of the time preferring to encourage his brothers with loud cheers and an overactive giggle. Of course he decided to get back on the horse right at the end of the session so he never got the chance to go again. Finally, Dylan, my teenager, was up (the wait between riders is not really very long and the men working the rider do a good job of moving it along at a fair pace). He hopped up, grabbed the rope for stability and....wiped out! Nearly everyone does the first time in an effort to gauge how it all works. His second time up was a breeze. After a few seconds he let go of the rope and was surfing the rider, face deep in concentration! Each time riding he increased his skill level and was catching the surfing bug again. The boys continued to ride for an hour and probably could have done 2 or 3 hours more even in the direct sun. I think they each got about 12 rides. A private time slot would be best but they start at $350 SD, a bit pricey but would probably well worth it if you were absolutely determined to learn to surf in one session. I would imagine after a few normal sessions most people would be ready for the barrel. Before we left we all went over to the barrel to watch. The barrel rider pumps 100,000 gallons of water per minute at a speed around 30 mph. There seemed to be some real pros out on that big wave, weaving in and out, doing jumps, and reveling in the cheers from the crowd as they pulled off another impressive trick. The entire area was just a hot bed of positive and fun energy! Details: The Wave House offers many deals throughout the week and year so be sure to check their website for the latest promotions. 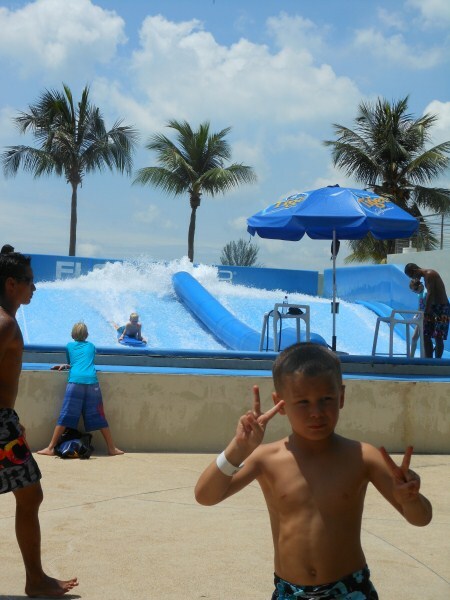 The standard rates for the flowrider are between $35 and $40 SD for 1 hour. The flow barrel is slightly more at between $45 and $50 SD for 1-hour time slot. They offer longer time periods, private rides, and memberships if you frequent the area. 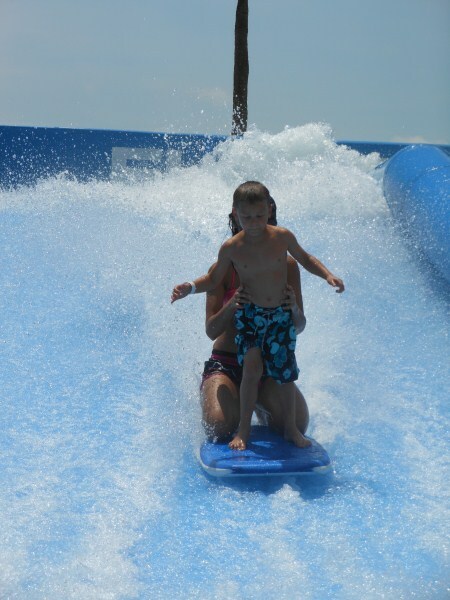 All riders need to fill out a release form, show an ID, and be at least 42" for the flow rider and 52" for the barrel. It is also recommended that if you have any medical conditions or if you are under the influence of drugs or alcohol to refrain from using either of the rider area. You can reach the Wave House by MRT (train) coupled with either the tram or cable car. Alternatively, you can take a taxi to Beach Station and then walk or take the free shuttle to the Wave House entrance. Operating hours are 9am-11pm every day of the week, but riders go from 10:30am-10:30pm and run every hour on the half hour. The most important question of the day, I suppose, is if the kids enjoyed it. When the ride ended and the water came to a trickle my 5-year-old looked at me with the biggest grin and said, "Mom, it was awesome..now I wanna go on that big one". I guess the answer is yes, they loved it! 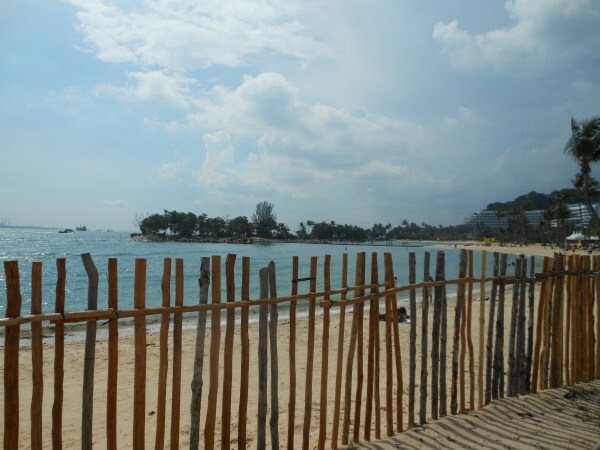 We would highly suggest this spot to anyone interested in surfing while visiting Singapore! But, admittedly, if you are a bit nervous in the water it may not be the place for you, as my 9-year-old can attest to. 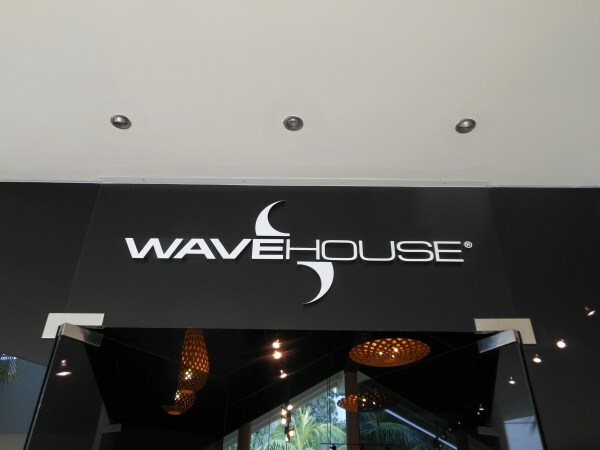 To keep up with all the latest events happening at the Wave House in Singapore be sure to follow them on Facebook and Twitter! 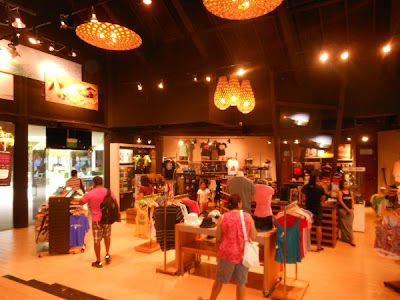 It is easy to get to and is a whole day of fun and interesting things for the whole family. It will be hot and a lot of walking. Especially if you have kids of course you can have a real time fun.